While the 2013-14 NBA rookie class has not aged well, Giannis Antetokounmpo already appears to be the top player from the 2013 draft (and perhaps several other years, too). As collectors are starting to take notice of "The Greek Freak," Giannis Antetokounmpo rookie cards are some of the most popular releases in the hobby. Although he put forth an inconsistent rookie year, Antetokounmpo has expanded his game fairly quickly. His extreme athleticism and versatility allows him to be played all over the court despite standing 6'11" and reportedly still growing. Already considered of the top up-and-coming players in the game, Antetokounmpo could very well headline the sport for years to come. 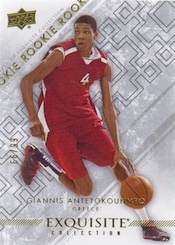 Shop for Giannis Antetokounmpo cards on eBay. As a top NBA pick, Antetokounmpo is available in a variety of products. 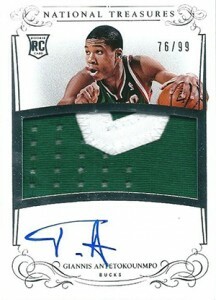 While his first card actually came in 2012-13 Exquisite Collection, Giannis Antetokounmpo rookie cards released in 2013-14 products. 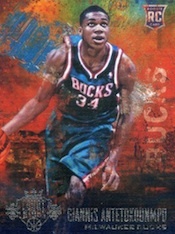 For more information, see a list of best Giannis Antetokounmpo rookie cards in our detailed guide. GIANNIS ANTETOKOUNMPO 2013 PANINI PRESTIGE #175 ROOKIE RC MILWAUKEE BUCKS MVP? 2013 Panini Hoops Giannis Antetokounmpo Rookie Base RC Milwaukee Bucks!